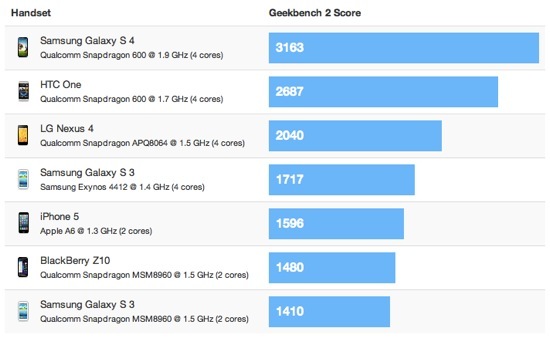 Primate Labs has compiled and analyzed the different benchmarks of popular smartphones, including all the latest Samsung Galaxy namely S4. The result is clear, it is far ahead of its competitors with its 3163 points. Over the benchmark, the higher the unit in question is rapid. It is twice as fast as its predecessor, which is a great technological feat in the space of a year. One of HTC second followed by Nexus 4 of LG. Then comes the smartphone we are interested in the iPhone 5. The Apple mobile has a benchmark of 1596, or 1,98 times less compared to the new model from Samsung. It is true that the Apple model 2012 date, it has been a few months the meter. And we know that technology is changing rapidly today. A note that during the passage of the iPhone 4S to the iPhone 5, the benchmark was 2,5 times better. Again, Apple has managed to make a good progress. The story goes he will repeat again this year with his successor. Of course, the numbers are not everything. The operating system is one of the major forces to take into account. iOS has the advantage of being both optimized for iPhone, iPad and on iPod touch. Apple develops its OS and its devices, the two are one. Samsung and others, it runs on Android, developed by Google. The giant then develops a system that will be placed on more devices in the future. Nevertheless, it is not optimized for such and such product that Google is not going to play to adapt to each model one by one. Indeed, it is the same phenomenon encountered with Windows and OS X, it can be installed on Mac, unlike the Microsoft solution. But Android has evolved tremendously to this day, it is the main opponent of iOS. This is because Apple has understood and responded this weekend.